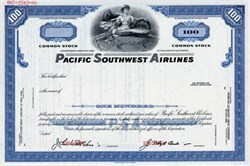 Beautiful specimen certificate from the Pacific Southwest Airlines Company printed in 1968. 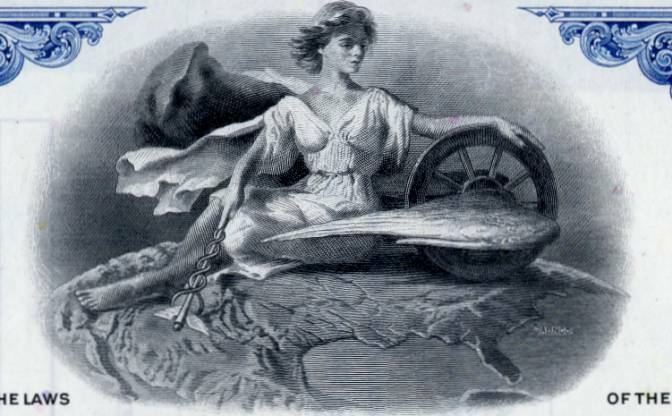 This historic document was printed by the American Bank Note Company and has an ornate border around it with a vignette of an allegorical woman with a flying wing. This item has the printed signatures of the Company’s President. Pacific Southwest Airlines was a United States airline headquartered in San Diego, California, that operated from 1949 to 1988. It was one of the first large discount airlines in the United States and is considered a precursor to Southwest Airlines. PSA was known by its slogan "The World's Friendliest Airline" and for the iconic smile painted on the nose of its airplanes, the PSA Grinningbirds... Opinion L.A. of the Los Angeles Times stated that PSA was "practically the unofficial flag carrier airline of California for almost 40 years." PSA is one of the four heritage airlines that form US Airways, the other airlines being America West Airlines, Piedmont Airlines and Allegheny Airlines. US Airways has now announced its intentions to merge with American Airlines under the American name. Its Boeing customer number was 14. Following the merger with USAir, the PSA name was given to Jetstream International Airlines in order to preserve the PSA name and trademarks.